In the wake of the attack on Charlie Hebdo, a flurry of articles have explored whether images of the Prophet Muhammad are “banned” in Islam. While some Muslim voices are adamant that this is strictly the case in Islamic law, others (both Muslim and non-Muslim) have cautioned that it is not so. Most public discussions of this so-called ban have explored verses in the Koran and Sayings by the Prophet, neither of which yield decisive results. What has been lost in the mix, however, is an exploration of the evidence found within Islamic law. Indeed, if one is to speak of a “ban,” then one must canvas a variety of Islamic jurisprudential sources in order to determine the legality or illegality of representing the Prophet in Islamic traditions. And if one carefully mines the sources, the results become much clearer — and much more nuanced and complex than one might anticipate. He thus concludes that images are not prohibited per se; rather, their legality depends on content and context. A century later, the staunchly Sunni theologian Ibn Taymiyya (died 1328)—who exerted great influence on today’s ultraconservative Wahhabi and Salafi theological movements—penned a hefty number of legal opinions. In his collection of fatwas, Ibn Taymiyya warns that images should not be used as a way to get closer to God, to seek His intercession, or to request a favor from Him. He also notes that Muslim practices must be differentiated from Christian ones, the latter defined by the prolific presence and use of images in churches. As a consequence, in even this most conservative collection of medieval fatwas, there does not exist a single expressly stated “ban” on images. The crux of the matter, rather, is that “images” of saints should not be used for requests and when seeking intercession, as is the case in Christian religious traditions. Moving forward through the centuries, the next major summary of legal opinions about images can be found in an essay-long fatwa written by Muhammad ‘Abduh (died 1905), best known as the reformist chief jurist (mufti) of modern Egypt. In his treatise titled Images and Representations: Their Benefits and The Opinions About Them, (see footnote 2) Muhammad ‘Abduh argues that the safeguarding of images and paintings represents a preservation of Islamic cultural heritage and knowledge. In addition, he stresses that, if images are not used in idolatry, then portraying people, plants and trees is not forbidden. In sum, during the second half of the 19th century, this reputed grand jurist proclaimed in no uncertain terms that images and paintings were both beneficial and educational. Muhammad ‘Abduh’s exposé was likely composed as a response to the spread and multiplication of images via the newly emergent printing press in Egypt. By far and large, before the 19th century, images were not publicly available, since they were embedded in rare luxury manuscripts and therefore restricted to a very small elite. With the onset of the mass media, however, new anxieties arose around the production and consumption of images. For these reasons, new forms of legal control over prophetic representations began to emerge in the form of legal decrees. Among them is a 1926 fatwa that was issued by the Sunni clerics at al-Azhar University in Cairo, which banned a film about Muhammad that was financed by the secular Turkish Republic. 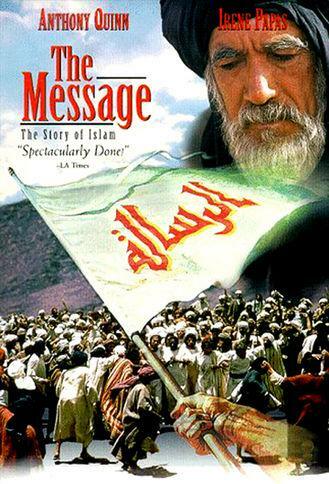 Fifty years later, the cinematographer Moustapha Akkad faced similar difficulties when he set out to film his biopic about Muhammad titled The Message (Figure 1). Although he received permission to produce the movie from the Sunni clerics at Al-Azhar, the Muslim World League—which is funded by Saudi Arabia and follows a strict Salafi interpretation of Islam—refused to approve the film even though Muhammad is never shown on screen (the movie is shot from the Prophet’s point of view). In the case of these two 20th-century movies, Egyptian and Saudi Arabian Sunni clerical bodies dissented on the manner in which Muhammad can be portrayed in film. This disagreement evidently did not fall along Sunni-Shi‘i sectarian lines. Skipping forward a couple decades, the legal landscape and the wrangling over images of Muhammad in particular become much more muddled from the 1990s onward. It appears that the year 1997 was a watershed in this regard. 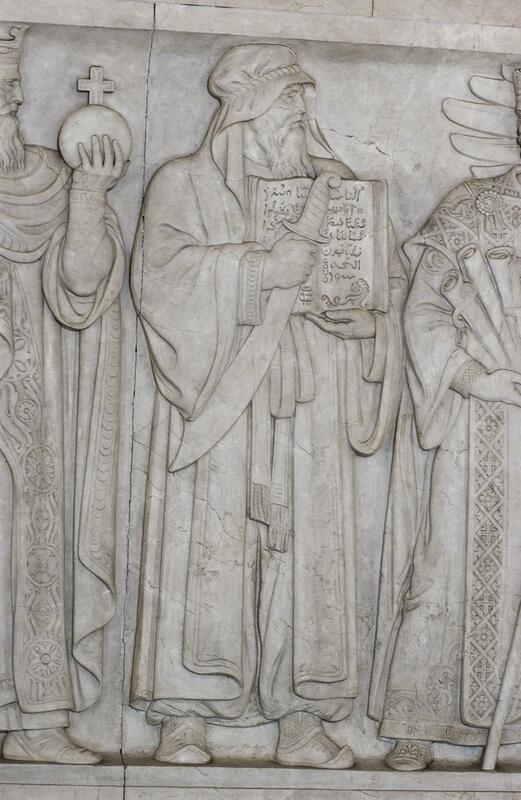 At this time, the Council on American-Islamic Relations (CAIR) wrote to Chief Justice William Rehnquist to request that the sculpted representation of the Prophet Muhammad in the north frieze inside the Supreme Court of the United States be removed or sanded down (Figures 2-3). 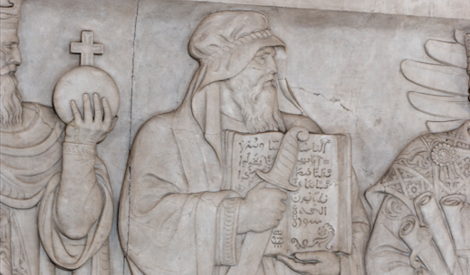 Included among the great lawgivers of history and standing between Justinian and Charlemagne, the turbaned Muhammad is shown holding the Qur’an—the source of Islamic law—and a sword—a symbol of justice within the Supreme Court’s pictorial program. What I have seen in the Supreme Courtroom deserves nothing but appreciation and gratitude from American Muslims. This is a positive gesture toward Islam made by the architect and other architectural decision-makers of the highest Court in America. God willing, it will help ameliorate some of the unfortunate misinformation that has surrounded Islam and Muslims in this country. Put simply, in the year 2000 one of the highest-ranking legal scholars who was then based in Saudi Arabia and also served as the chairman of the principal council on Islamic law in America judged a sculptural representation of Muhammad in the nation’s capital both permissible and laudable. But then 9/11, the U.S.-led invasion of Iraq and the Danish cartoons of 2005 happened. Without a doubt, the derogatory Jyllands-Posten caricatures of Muhammad were enmeshed in the complex geopolitics, the shifting European demographic landscape and the Middle Eastern wars of the post-9/11 period. Understood as an attack and an affront to the Islamic faith, these cartoons were denounced by Saudi imams as sacrilegious in 2006. It is at this very moment that we suddenly see the more precise statement that “Islam considers images of prophets disrespectful and caricatures of them blasphemous.” Along with this brand new legal proclamation, Saudi companies and organizations launched a boycott against Danish goods, including medicine, dairy products and Lego toys. Flexing its monetary muscles to the tune of billions of dollars, Saudi Arabia’s counterblow resulted in hefty financial losses for Denmark. Thus, this relatively recent Saudi fatwa against images of Muhammad also shows how loudly money talks. Since 2005, Islamic law has evolved with contemporary circumstances and further fatwas against images of Muhammad have emerged. A number of these are easily accessible because they are available online as electronic fatwas (or e-fatwas). Two representative examples reveal that the legality or illegality of representing Muhammad remains an unresolved issue within the Islamic world. For instance, the Salafi position remains utterly uncompromising: Images of the Prophet and his companions are not permissible whatsoever. On the other hand, Ayatollah al-Sistani, the supreme Shi‘i legal authority in Iraq, opines that representations of the Prophet are acceptable as long as they show due deference (ta‘zim) and respect (tabjil) (in English and Arabic). It thus should come as no surprise that today reverential depictions of the Prophet can be found in Shi‘i-majority areas, especially Iraq, Iran and Lebanon (Figure 4). Indeed, there exists a lively market for these kinds of devotional pictures, objects and even rugs, which are purchased by many Muslims who do not tread the Salafi line. In these latest disagreements between Sunni-Salafi and Shi‘i scholars of Islamic law, it is easy to see how some might argue that the divergence in legal opinion falls along the sectarian divide. While this certainly rings true today, this was not the case before the Danish cartoons of 2005. Indeed, in the year 2000, the Sunni legal scholar al-Alwani praised and expressed gratitude for the depiction of Muhammad in the Supreme Court while, during the 20th century, Sunni legal bodies disagreed with one another as they turned to tackling the emergence of public images of Muhammad precipitated by the printing press and the motion picture industry. 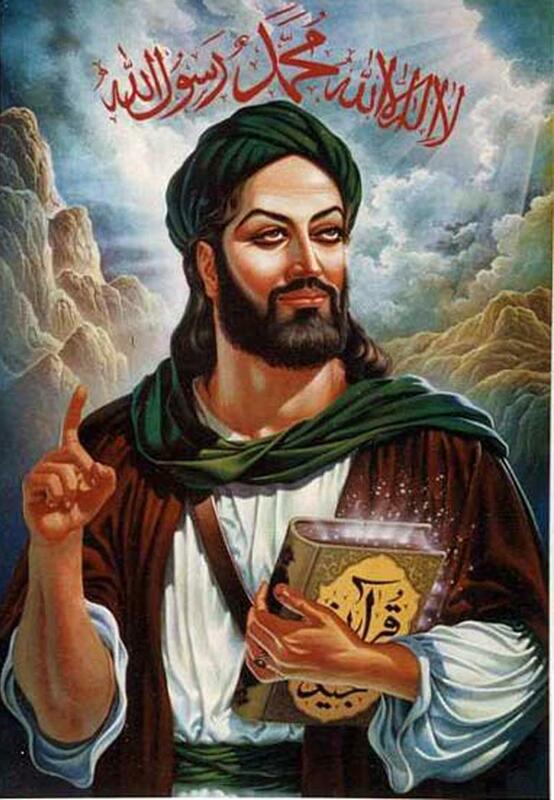 Before then and stretching back to the 12th century, scholars of Islamic law, among them famous Sunni luminaries, did not expressly forbid images, including representations of Muhammad. So the notion of a long-standing and immutable Islamic “ban” on images of the Prophet is nothing if not a contemporary innovation, catalyzed by the mass media, accelerated by insulting cartoons, and propelled throughout the world via the seismic influence of Saudi petrodollars. Footnote 1: Michael Cook, Commanding Right and Forbidding Wrong in Islamic Thought. (Cambridge: Cambridge University Press, 2000), 145-146, footnote 2. Footnote 2: Muhammad ‘Abduh, Ta’rikh al-Ustadh al-Imam al-Shaykh Muhammad ‘Abduh (Cairo: Manar Publisher, 1344/1925), vol. 2, 498-502. Excellent article. Of course there is no prohibition in Islam or the Holy Quran of making images or displaying them even of the Prophet and his companions. The only prohibition will be due to the content such as indecency etc. I think the prohibition on making and displaying images of living beings is very old, even from early days of Islam. A cursory look at the Muslim architecture shows abcense of living images whereas paterns and Arabic calligraphy is frequently observed. Same applies to the images of the Prophet. This is in stark contrast to other religions where the images and figures of their revered figures are very common. Another fine article posted by The Muslim Times. It is incorrect to say that pictures are not forbidden in Islamic Law. While one legal school (Malikis) seems to permit two-dimensional images, the other legal schools prohibit drawings, paintings, etc of animate life. Some (Shafi’is) prohibit even drawing a hand, while otthers (Hanafis) seemingly permit a seperated hand, or headless person, but not a whole person unless it is very tiny. Also, as you point out, Ibn Taymiyyah is an authority to the EXTREMIST Wahhabi/Salafi sect, but you mistakenly labeled him as Sunni. He died in prison, incarcerated to prevent him from teaching heretical beliefs – not exactly a Orthodox Sunni, nor a valid source of Sunni Law. Muhammad ‘Abduh, also, is not Orthodox. He was a “Reformer” one who struggled with post-colonialism and did NOT defer to classical understandings. Regarding Shaykh Taha Jaber al-Alwani, he is correct that there is no FIRM prohibition, in the sense that there is a minority disagreement (the Maliki school of law, see above), but that doesn’t mean the prohibition does not exist, it means that there is not consensus on it. (Muslims take consensus very seriously, and feel that where scholars disagree there is always the possibility that one opinion or the other is correct, even while one and not the other. There is a nuance there.) As far as him saying that the Supreme Court image is positive, there are factors there like a) Muslims only consider Islamic Law to apply to Muslims, and just as they don’t say Catholic can’t drink wine or eat pork, Shariah does not prohibit non-Muslims from drawing pictures or following other aspects of the religion. b) There is wisdom is building bridges, to show Americans that the tension between America and Islam is a media/coprorate/political invention and not inherent, as evidenced by such an image. But, thew standard, default, mainstream Islamic Law position is to prohibit drawings animate life, and there is CONSENSUS among Sunnis that NO PROPHET (God bless them all) may be depicted – which is why in that movie The Message there is NO ACTOR PLAYING MUHAMMAD (God bless him).